The gathering of power sources has been a thing we see in our favorite stories since time immemorial. And, oddly, there is even a pretty strong pattern of it being associated with jewelry. The nine rings, the three crowns. Heck, even a team of magically endowed environmentalists had their cheer. So, it should come to no surprise that gathering up six gemstones that bear with them the weight of all of existence (and a little bit of non-existence) is going to have a major impact on the inner workings of the cosmos. That's a lot of responsibility, there. 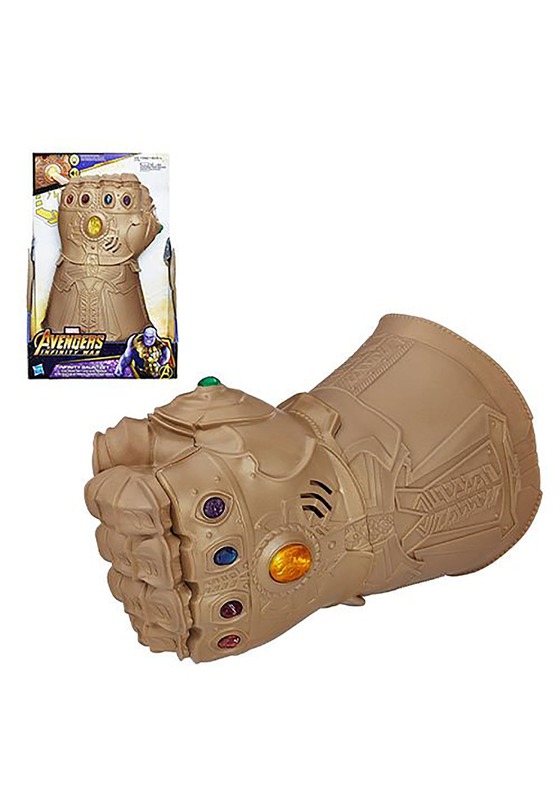 So, it is not with just a grain of salt that we present this officially licensed Avengers: Infinity War Electric Fist Infinity Gauntlet. This cosmic marvel features light and sound effects courtesy of a slightly lesser powered collection of batteries... but at least they are easier to come by than Infinity Stones. The trouble with trying to gain omnipotence is that there is always something that you're going to have to do that is going to be just a little too difficult and costly than you're ready for. Rather than traveling to awful sites and giving up your blood to a cause, you can have all the fun of omnipotence for the price of a few batteries a month.